America's untold true stories: A spunky little nation, unprepared and ignored in a world of conflict . . . A mediocre poet from Maryland who could've been President if he'd just said yes . . . and what is he doing on a British truce vessel in the middle of a bombardment? The commandant of a tiny fort who thinks his boring outpost might be important some day . . . A Baltimore widow asked to make a flag as big as her house . . . One day in 1814, these ordinary people would be within five miles of each other, witness to the same stunning event, and they would change history. 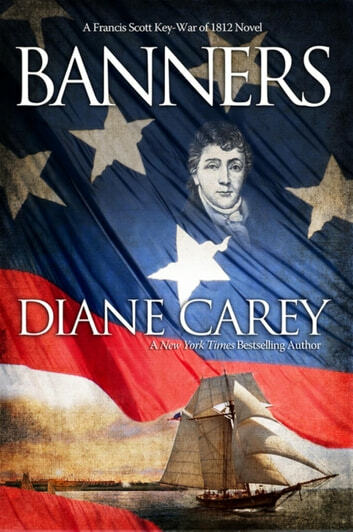 At a time when the only instant communication over distances was done with signal flags, a country with only 6 warships declares war on a navy with 900 . . . A reckless American privateer captain takes the War of 1812 to the very doorsteps of London . . . A Royal Navy captain is obsessed and humiliated into a acts of revenge . . . A foreign spy known only as the French Jew tries to manipulate them all . . . Banners is the novel that fills the gaps in American history--the details we all think we know, but don't really . . . who are these people, and how did their independent actions turn world politics and warfare upside down?